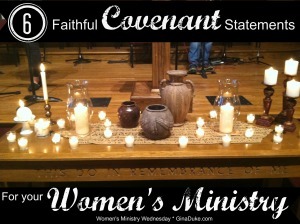 Have you considered utilizing covenants for your women’s ministry? I recently attended the Women’s Ministry Leader’s Forum sponsored by Lifeway, and in one of my sessions many of the leaders shared how they required their leadership teams to sign covenant agreements. 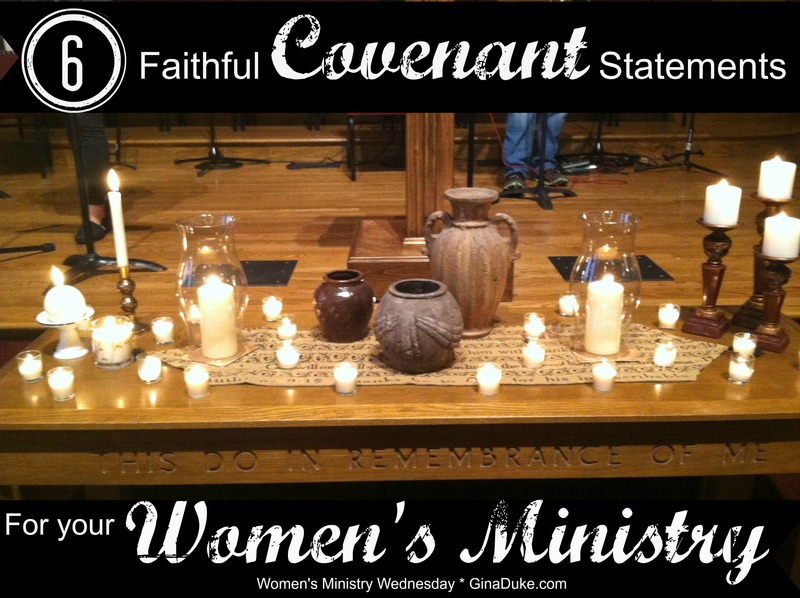 Although, I have not required my core leadership team to sign a covenant, I do require all of the women who participate in our women’s involvement ministry to sign one. Our women’s involvement ministry team is made up of eight teams of 4 to 6 women, so I believe that it is important that they recognize how important their positive participation is in that team. By signing a covenant, it helps convey the importance of this ministry, expectations of excellence and unity. In the event that you are interested in using a covenant, here is the one I use below. Perhaps you can borrow some of its verbiage? I will faithfully complete all tasks set before me and my team for the Glory of God! Overwhelmingly, I heard other leaders say that they also added a statement about the participant’s husband being in agreement with her participation in the women’s ministry. So, you may want to consider this as well. If you use a covenant, please share some of your verbiage in the comments section below, which will provide us with a robust database of usable covenant statements for future reference. I’ve had these sorts of requests come up, from time to time, of being asked to sign a covenant agreement as part of a fellowship group or a men’s ministry. I’ve always felt very uncomfortable with the idea, and have found that others have also been reluctant…and usually the most mature participants were also the most reluctant. I view a covenant as being a very significant relationship, such as a marriage. Thus I am not eager to jump into new covenants with people I may not know well, or may not be sure how well I can work with. Generally speaking, all of the most signficiant vows in these sorts of ‘fellowship covenants’ are already covered by an existing covenant anyway. Am I willing to commit to regular prayer and Bible reading? Sure! But I am already committed to doing that as part of my covenant with Christ, so why would I swear such a vow to someone else? And in regards to attendance, if I join a group it is with the intent of attending meetings…and if I fail to attend regularly enough feel free to kick me out of the group. However, I have covenant commitments that trump my fellowship group attendance commitments. I have a family to care for. I have an employer. I have other responsibilities. Thus, it would be over-reaching to swear a sacred oath to attend every meeting. I won’t take a sacred vow to do something I already know I will not be able to fully fulfill without violating a more sacred trust. I think if someone is uncomfortable using the term “covenant”, they can use another term that will convey the same level and message of commitment. I guess for me, I am trying to highlight the importance of their required commitment to serve in this ministry. Unfortunately, and I think this is the norm in any church, people are more lax to their church commitments than they are to their other commitments. I’ve seen people get mad about something at church and stop coming, when if the same thing happened at work it would never cross their mind to quit. People’s kids get their feelings hurt and they will stop coming when they would never stop sending their kids to school for the same thing. This should not be. We serve the body of Christ that we have joined because we believe God has led us there. We serve in the ministries that we believe God has called us to based upon on our spiritual giftings and God’s leading. And because we believe this, even if we feel mistreated or get our feelings hurt, we do not pick up our toys and go home. God’s call trumps our emotions and want-to, or lack thereof. This is what I want the women to get that participate in our women’s ministry. This is what being part of a body is all about – we cannot function properly without everyone doing their part. Are we militant about it? I hope not. My leaders and I, along with the team facilitators understand sick kids, etc. Because we volunteer at church, it should not be viewed as something we can be casual with. I want believers to feel called to a ministry and be passionate enough about it that it becomes a top priority. For full disclosure, our women’s involvement ministry only meets the first Wednesday night of the month, which is during our regular service time. And they are only committed to this team for 3 months then they rotate. Women jump in and off during the rotation change based upon their other responsibilities. BUT while they have committed (after attending an orientation), I do expect them to be committed to working with that team for those three months to accomplish their ministry projects. Again, Joe, I will continue to ponder your points. Good word! Thanks for stopping by. Yes, I do understand the concerns about level of commitment and the necessity of having leaders actually do what they said they would do. And you’re right about people often being more casual about church commitments than they would be about other aspects of life. What if it was just called an Expectations List, and each person was asked to sign it as recognition that they understand the expectations and intend to follow through in fulfilling those expectations? To me, that would be much easier to accept. I see ‘covenant’ as a term I reserve for much more serious long-term relationships. Blessings to you and your ministry, Gina! Joe, what I’ve just realized is that no matter what we call it, it is just sad that it would even be needed in God’s work. Just as you referenced earlier, your level of commitment is based upon your personal commitment to Christ. Oh, may we be that kind of church! Thanks for your thoughts, Joe! This is something I have always wished I had done with my teams. It’s such a great accountability tool. And if an issue arises you can refer to the covenant. I love how the wording you have used positively addresses some “negative” things that might happen – gossip, negative attitudes, etc. I can’t wait to hear what other leaders share! Thanks, Cyndee! I hope other leaders share some of their covenant’s, too! Hello Gina, I am enjoying your site. I was in Women’s Ministry for 8 years and then out for 20. . So since God gifted me with a very creative mind I have slowly brought out different ideas and fruited them. Last year I brought a small group of women together to plan a ladies function as there was nothing happening at that level and was applauded for my method of discipleship. Since I have over 30 years in that area it is natural for that to be my teaching structure. Out of that situation a conflict developed which taught me a lot about the forgiveness and grace God allows. I ask that if using a contract it include, what happens here stays here. Biblically limiting gossip. I love your Prayer Closet Book; my heart. Linda, that is a very good thought. My covenant was for ministry work teams, but I can see how that would make sense for a small group sharing. Thank you for your many years of service in women’s ministry. I love how God uses our creativity to honor Him and draw others to Christ. Thank you for stopping by!